Many times I've mentioned the foreign-policy assessments of William R. Polk, at right, who first wrote for the Atlantic (about Iraq) during Dwight Eisenhower's administration, back in 1958, and served on the State Department's Policy Planning staff during the Kennedy years. He now has sent in a detailed analysis about Syria. Polk wrote this just before President Obama switched from his go-it-alone policy and decided to seek Congressional approval for a Syrian strike. It remains relevant for the choices Congress, the public, and the president have to make. It is very long, but it is systematically laid out as a series of 13 questions, with answers. If you're in a rush, you could skip ahead to question #7, on the history and use of chemical weapons. 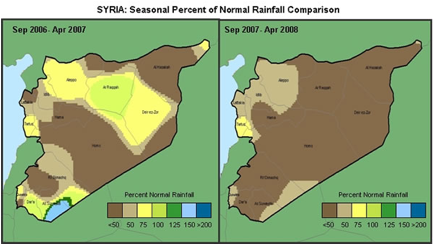 Or #6, about the under-publicized role of drought, crop failure, and climate change in Syria's predicament. But please consider the whole thing when you have the time to sit down for a real immersion in Congress's upcoming decision. It wouldn't hurt if Senators and Representatives read it too. Probably like you, I have spent many hours this last week trying to put together the scraps of information reported in the media on the horrible attack with chemical weapons on a suburb of Damascus on Wednesday, August 21. Despite the jump to conclusions by reporters, commentators and government officials, I find as of this writing that the events are still unclear. Worse, the bits and pieces we have been told are often out of context and usually have not been subjected either to verification or logical analysis. So I ask you to join me in thinking them through to try to get a complete picture on what has happened, is now happening and about to happen. I apologize for both the length of this analysis and its detail, but the issue is so important to all of us that it must be approached with care. Because, as you will see, this is germane in examining the evidence, I should tell you that during my years as a member of the Policy Planning Council, I was "cleared" for all the information the US Government had on weapons of mass destruction, including poison gas, and for what was then called "Special Intelligence," that is, telecommunications interception and code breaking. [JF note: This is the list of questions around which the rest of the essay is structured.] I will try to put in context 1) what actually happened; 2) what has been reported; 3) who has told us what we think we know; 4) who are the possible culprits and what would be their motivations; 5) who are the insurgents? 6) what is the context in which the attack took place; 7) what are chemical weapons and who has used them; 8) what the law on the use of chemical weapons holds; 9) pro and con on attack; 10) the role of the UN; 11) what is likely to happen now; 12) what would be the probable consequences of an attack and (13) what could we possibly gain from an attack. On Wednesday, August 21 canisters of gas opened in several suburbs of the Syrian capital Damascus and within a short time approximately a thousand people were dead. That is the only indisputable fact we know. Drawing primarily on Western government and Israeli sources, the media has reported that canisters of what is believed to be the lethal nerve gas Sarin were delivered by surface-to-surface rockets to a number of locations in territory disputed by the Syrian government and insurgents. 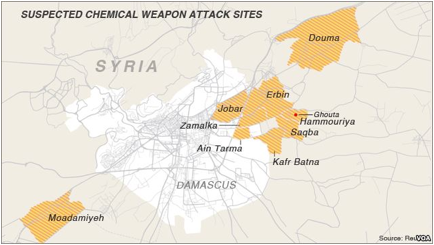 The locations were first reported to be to the southwest, about 10 miles from the center of Damascus, and later reported also to be to the east of the city in other suburbs. The following Voice of America map shows the sites where bodies were found. A UN inspection team that visited the site of the massacre on Monday, August 26, almost 5 days after the event. IPS’s Gareth Porter concluded after talks with chemical weapons experts and government officials that “The administration’s effort to discredit the investigation recalls the George W. Bush administration’s rejection of the position of U.N. inspectors in 2002 after they found no evidence of any weapons of mass destruction in Iraq and the administration’s refusal to give inspectors more time to fully rule out the existence of an active Iraqi WMD programme. In both cases, the administration had made up its mind to go to war and wanted no information that could contradict that policy to arise.” Is this a fair assessment? Why was the first UN inspection so limited? The only publicly known reason is that it came under sniper fire while on the way to the first identified site. Who fired on it or for what reason are, as of this writing, unknown. The area was contested by one or more rebel groups and under only limited or sporadic control by the Syrian government. Indeed, as photographs published by The New York Times on August 29, show the UN inspectors in one area (Zamaka) guarded by armed men identified as “rebel fighters.” So the sniper could have been almost anyone. "The committee did not visit any house in the district. We asked the committee to exhume the bodies for checking them. But they refused. They say that there was no need to do that. 'We had prepared samples for the committee from some bodies and video documentation. There were urine and blood samples as well as clothes. But they refused to take them. 'After an hour and a half, they got an order from the regime to leave ASAP. The security force told the committee if they did not leave now, they could not guarantee their security. They could not visit the main six sites where the chemical rockets had fallen and lots of people were killed.' "
Why did the investigators not do a more thorough job? The doctor at the site told the Guardian reporter that the Assad regime warned the investigators that they should leave because it could not guarantee their safety but the newspaper’s headline says that the Syrian government authorities ordered them out. Which is true? Is there another explanation? And why did the inspection team not have the means to retrieve parts of the delivery equipment, presumably rockets? Were they told by the UN or other authorities not to retrieve them or were they refused permission by the Syrian government? We simply do not know. To say the least, the inspection was incomplete. The best that the State Department spokesman could say about such evidence as was gathered is that there is “’little doubt’ [Vice President Biden later raised the certainty from the same limited evidence to “no doubt”] that forces loyal to Mr. Assad were responsible for using the chemical weapons.” (“’Little Doubt’ Syria Gassed Opposition,” The Wall Street Journal,August 26, 2013). Much was made of the belief that the gas had been delivered by rocket. However, as The New York Times correspondent Ben Hubbard reported (April 27, 2013) “”Near the attack sites, activists found spent rockets that appeared to have been homemade and suspected that they delivered the gas.” Would the regular army’s chemical warfare command have used “homemade” rockets? That report seemed to point to some faction within the opposition rather than to the government. Two things should be borne in mind on these reports: the first is that Israel has had a long-standing goal of the break-up or weakening of Syria which is the last remaining firmly anti-Israeli Arab state. (the rationale behind this policy was laid out by Edward Luttwak in the OpEd section of the August 24, 2013 New York Times). It also explains why Israel actively had sought “regime change” in Iraq. The second consideration is that Israeli intelligence has also been known to fabricate intercepts as, for example, it did during the 1967 Arab-Israeli war. 4: Who Are the Possible Culprits and What Would be Their Motivations? First, who gains by the action. I do not see what Assad could have gained from this gas attack. It is evident that while the area in which it took place is generally held to be "disputed" territory, the government was able to arrange for the UN inspection team to visit it but not, apparently, to guarantee their safety there. If Assad were to initiate an attack, it would be more logical for him to pick a target under the control of the rebels. Second, to have taken the enormous risk of retaliation or at least loss of support by some of his allies (notably the Russians) by using this horrible weapon, he must have thought of it either as a last ditch stand or as a knockout blow to the insurgents. Neither appears to have been the case. Reports in recent weeks suggest that the Syrian government was making significant gains against the rebels. No observer has suggested that its forces were losing. All indications are that the government’s command and control system not only remains intact but that it still includes among its senior commanders and private soldiers a high proportion of Sunni Muslims. Were the regime in decline, it would presumably have purged those whose loyalties were becoming suspect (i.e. the Sunni Muslims) or they would have bolted for cover. Neither happened. Moreover, if it decided to make such an attack, I should have thought that it would have aimed at storage facilities, communications links, arms depots or places where commanders congregated. The suburbs of Damascus offered none of these opportunities for a significant, much less a knockout, blow. Third, as students of guerrilla warfare have learned guerrillas are dispersed but civilians are concentrated. So weapons of mass destruction are more likely to create hostility to the user than harm to the opponent. The chronology of the Syrian civil war shows that the government must be aware of this lesson as it has generally held back its regular troops (which were trained and armed to fight foreign invasion) and fought its opponents with relatively small paramilitary groups backed up by air bombardment. Thus, a review of the fighting over the last two years suggests that its military commanders would not have seen a massive gas attack either as a “game changer” or an option valuable enough to outweigh the likely costs. So, what about the enemies of the Assad regime? How might such an attack have been to their advantage? First, a terrorizing attack might have been thought advantageous because of the effect on people who are either supporting the regime or are passive. There are indications, for example, that large numbers of the pathetic Palestinian refugees are pouring out their camps in yet another "displacement." The number of Syrian refugees is also increasing. Terror is a powerful weapon and historically and everywhere was often used. Whoever initiated the attack might have thought, like those who initiated the attack on Guernica, the bombing of Rotterdam and the Blitz of London, that the population would be so terrorized that they might give up or at least cower. Then as food shortages and disease spread, the economy would falter. Thus the regime might collapse. That is speculative, but the second benefit to the rebels of an attack is precisely what has happened: given the propensity to believe everything evil about the Assad regime, daily emphasized by the foreign media, a consensus, at least in America, has been achieved is that it must have been complicit. This consensus should make it possible for outside powers to take action against the regime and join in giving the insurgents the money, arms and training. We know that the conservative Arab states, the United States, other Western powers and perhaps Israel have given assistance to the rebels for the last two years, but the outside aid has not been on a scale sufficient to enable them to defeat the government. They would need much more and probably would also need foreign military intervention as happened in Libya in April 2011 to overthrow Muamar Qaddafi. The rebels must have pondered that situation. We know that foreign military planners have. (See “Military Intervention in Syria” Wikileaks reprinted on August 25, 2013, memorandum of a meeting in the Pentagon in 2011.) Chillingly, the just cited Wikileaks memorandum notes that the assembled military and intelligence officers “don’t believe air intervention would happen unless there was enough media attention on a massacre, like the Ghadafi [sic] move against Benghazi.” (See Time, March 17, 2011.) As in Libya, evidence of an ugly suppression of inhabitants might justify and lead to foreign military intervention. Clearly, Assad had much to lose and his enemies had much to gain. That conclusion does not prove who did it, but it should give us pause to find conclusive evidence which we do not now have. 5: Who are the insurgents? We know little about them, but what we do know is that they are divided into hundreds – some say as many as 1,200 -- of small, largely independent, groups. And we know that the groups range across the spectrum from those who think of themselves as members of the dispersed, not-centrally-governed but ideologically-driven association we call al-Qaida, through a variety of more conservative Muslims, to gatherings of angry, frightened or dissatisfied young men who are out of work and hungry, to blackmarketeers who are trading in the tools of war, to what we have learned to call in Afghanistan and elsewhere "warlords." Each group marches to its own drumbeat and many are as much opposed to other insurgents as to the government; some are secular while others are jihadists; some are devout while others are opportunists; many are Syrians but several thousand are foreigners from all over the Middle East, Europe, Africa and Asia. Recognition of the range of motivations, loyalties and aims is what, allegedly, has caused President Obama to hold back overt lethal-weapons assistance although it did not stop him from having the CIA and contractors covertly arm and train insurgents in Jordan and other places. The main rebel armed force is known as the Free Syrian Army. It was formed in the summer of 2011 by deserters from the regular army. Similar to other rebel armies (for example the “external” army of the Provisional Algerian Government in its campaign against the French and various “armies” that fought the Russians in Afghanistan) its commanders and logistical cadres are outside of Syria. Its influence over the actual combatants inside of Syria derives from its ability to allocate money and arms and shared objectives; it does not command them. So far as is known, the combatants are autonomous. Some of these groups have become successful guerrillas and have not only killed several thousand government soldiers and paramilitaries but have seized large parts of the country and disrupted activities or destroyed property in others. In competition with the Free Syrian Army is an Islamicist group known as Jabhat an-Nusra (roughly “sources of aid”) which is considered to be a terrorist organization by the United States. It is much more active and violent than groups associated with the Free Syrian Army. It is determined to convert Syria totally into an Islamic state under Sharia law. Public statements attributed to some of its leaders threaten a blood bath of Alawis and Christians after it achieves the fall of the Assad regime. Unlike the Free Syrian Army it is a highly centralized force and its 5-10 thousand guerrillas have been able to engage in large-scale and coordinated operations. Of uncertain and apparently shifting relations with Jabhat an-Nusra, are groups that seem to be increasing in size who think of themselves as members of al-Qaida. They seem to be playing an increasing role in the underground and vie for influence and power with the Muslim Brotherhood and the dozens of other opposition groups. Illustrating the complexity of the line-up of rebel forces, Kurdish separatists are seeking to use the war to promote their desire either to unite with other Kurdish groups in Turkey and/or Iraq or to achieve a larger degree of autonomy. (See Harald Doornbos and Jenan Moussa, “The Civil War Within Syria’s Civil War,” Foreign Policy, August 28, 2013). They are struggling against both the other opposition groups and against the government, and they too would presumably welcome a collapse of the government that would lead to the division of the country into ethnic-religious mini-states. It seems reasonable to imagine that at least some and perhaps all of these diverse groups must be looking for action (such as a dramatic strike against the regime) that would tip the scale of military capacity. Listening to the world media and to the intelligence agents who circulate among them, they must hope that an ugly and large-scale event caused by or identified with the government might accomplish what they have so far been unable to do. 6: What Is the Context in Which the Attack Took Place? 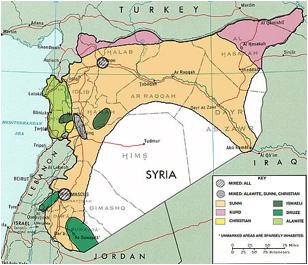 Syria is and has always been a complex society, composed of clusters of ancient colonies. Generally speaking, throughout history they have lived adjacent to one another rather than mixing in shared locations as the following map suggests. The population before the outbreak of the war was roughly (in rounded numbers) 6 in 10 were Sunni Muslim, 1 in 7 Christian, 1 in 8 Alawi (an ethnic off-shoot of Shia Islam), 1 in 10 Kurdish Muslim, smaller groups of Druze and Ismailis (both off-shoots of Shia Islam) and a scattering of others. Despite these tragic losses, the war is now thought to be stalemated: the government cannot be destroyed and the rebels cannot be defeated. The reasons are not only military: they are partly economic-- there is little to which the rebels could return; partly political – the government has managed to retain the loyalty of a large part of the majority Muslim community which comprises the bulk of its army and civil service whereas the rebels, as I have mentioned, are fractured into many mutually hostile groups; and partly administrative -- by and large the government’s structure has held together and functions satisfactorily whereas the rebels have no single government. 7: What are Chemical Weapons and Who Has Used Them? When I was a member of the Policy Planning Council and was “cleared” for all information on weapons of mass destruction, I was given a detailed briefing at Fort Meade on the American poison gas program. I was so revolted by what I learned that I wrote President Kennedy a memorandum arguing that we must absolutely end the program and agree never to use it. Subsequently, the United States is said to have destroyed 90% of its chemical weapons. My feelings aside, use of chemical weapons has been common. As the former head of the US Congress’s committee on foreign affairs and later president of the Woodrow Wilson Center, Lee Hamilton, told me, his experience was that when a weapon was available, the temptation to use it was almost irresistible. History bears him out. While most people were horror-stricken by the use of gas, governments continued to use it. In times of severe stress, it became acceptable. As Winston Churchill wrote, use “was simply a question of fashion changing as it does between long and short skirts for women.” Well, perhaps not quite, but having begun to use gas in the First World War, when about 100,000 people were killed by it, use continued. After the war, the British, strongly urged by Churchill, then Colonial Secretary, used combinations of mustard gas, chlorine and other gases against tribesmen in Iraq in the 1920s. As he said, “I am strongly in favour of using poisoned gas against uncivilised tribes.” In the same spirit, the Spaniards used gas against the Moroccan Rif Berbers in the late 1920s; the Italians used it against Ethiopians in the 1930s; and the Japanese used it against the Chinese in the 1940s. Churchill again: during the Second World War, he wrote that if the Blitz threatened to work against England, he “may certainly have to ask you [his senior military staff] to support me in using poison gas. We could drench the cities of the Ruhr and many other cities in Germany…” More recently in 1962, I was told by the then chief of the CIA's Middle Eastern covert action office, James Critichfield that the Egyptians had used lethal concentrations of tear gas in their campaign against royalist guerrillas in Yemen. America used various chemical agents including white phosphorus in Vietnam (where it was known as “Willie Pete”) and in Fallujah (Iraq) in 2005. We encouraged or at least did not object to the use of chemical agents, although we later blamed him for so doing, by Saddam Husain. Just revealed documents show that the Reagan administration knew of the Iraqi use in the Iraq-Iran war of the same poison gas (Sarin) as was used a few days ago in Syria and Tabun (also a nerve gas). According to the US military attaché working with the Iraqi army at the time, the US government either turned a blind eye or approved its use (see the summary of the documents in Shane Harris and Matthew Aid, "Exclusive: CIA Files Prove America Helped Saddam as He Gassed Iran," Foreign Policy, August 26, 2013) We were horrified when Saddam Husain used poison gas against the Kurdish villagers of Halabja in 1988 (killing perhaps 4-5 thousand people) but by that time we had dropped our support for the Iraqi government. Finally, Israel is believed to have used poison gas in Lebanon and certainly used white phosphorus in Gaza in 2008. I cite this history not to justify the use of gas – I agree with Secretary Kerry that use of gas is a “moral obscenity” -- but to show that its use is by no means uncommon. It is stockpiled by most states in huge quantities and is constantly being produced in special factories almost everywhere despite having been legally banned since the Geneva Protocol of June 17, 1925. 8: What Is Current Law on the Use of Chemical Weapons? Use, production and storage of such weapons was again banned in the 1993 Chemical Weapons Convention (to which Syria it not a party). But nearly all the signatories to that convention reserved the right legally to use such weapons if the weapons had been used against them (i.e. no first strike). The Convention, unfortunately, contains no provision banning the use of weapons, as Saddam certainly did and as Assad is accused of doing, in civil war. My understanding of the current law, as set out in the 1993 Convention, is that the United States and the other NATO members are legally entitled to take military action only when we – not their citizens -- are actually threatened by overt military attack with chemical weapons. Putting the legal issue aside, there is precedent. A part of the rationale for the 2003 U.S. attack on Iraq was the charge that it had or was developing weapons of mass destruction including poison gas which it planned to use against us. This was the essence of Secretary of State Collin Powell’s presentation to the United Nations Security Council on February 6, 2003. Powell then realized that there was no evidence to back up his charge (and it was later shown to be false), but that did not stop or even delay the attack. The determination to attack had already been made, regardless of evidence. An attack was undoubtedly then generally approved by the American public and its elected representatives. They, and our NATO allies, concluded on the basis of what the second Bush administration told them that there was a threat and, therefore, that action was not only necessary for defense but also legal. It is the memory of this grave misleading of the public that haunts at least some government officials and elected representatives today. "As he often so eloquently does, President Obama said on August 23, '…what I think the American people also expect me to do as president is to think through what we do from the perspective of, what is in our long-term national interests?…Sometimes what we’ve seen is that folks will call for immediate action, jumping into stuff, that does not turn out well, gets us mired in very difficult situations, can result in us being drawn into very expensive, difficult, costly interventions that actually breed more resentment in the region.' "
However, as I point out below, his actions, as unfortunately also is typical of him, do not seem to mesh with his words. There has been a steady outpouring of informed non-governmental opposition to an attack. 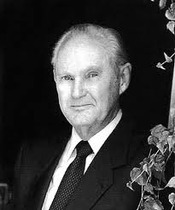 Sir Andrew Green, the former British ambassador called it “poor foolishness…It beggars belief that we appear to be considering an armed attack on Syria with no clear purpose and no achievable objective.” (Blundering into war in Syria would be pure foolishness.” The English Conservative Party daily, Conservative Home, August 26, 2013). This was from a member of the Prime Minister’s Conservative party; the Labour opposition was even more opposed to the adventure. The Russian government was outspoken in opposition. Many Western commentators regarded their opposition as a sort of echo of the Cold War, but the Russians were acutely aware of the danger that their own large (16% of their population) and growing Muslim population might be affected by the “forces of extremism in country after country in the Middle East by [the US] forcing or advocating a change in leadership – from Iraq to Libya, Egypt to Syria.” (Steven Lee Myers, “Putin stays quiet as his aides assail the West,”International Herald Tribune, August 29, 2013) As I have mentioned, President Obama believed that the Russians would veto the resolution the British had submitted to the Security Council before the English Parliament voted down the Prime Minister’s plan to intervene. 10): What is the role of the United Nations? Perhaps the most important role of the United Nations has not been in the highly publicized meetings and decisions of the Security Council, but in its specialized agencies, particularly the Food and Agricultural Organization (FAO) in the attempt to mobilized food aid and the High Commission for Refugees (HCR) in attempting to ameliorate the conditions of the millions of people displaced by the fighting. They have had little to work with. But it is the UN in its more peace seeking role that is now in the forefront. Weapons experts from the UN are conducting the investigation of the sites where the victims were killed. There has been, as I mentioned above, an effort to end their work after their initial visit, but the UN Secretary General insisted that they continue for at least two more days. The British, French and American governments have attempted also to limit the role of the UN to give them more latitude for whatever action they wish to take. Indeed, the US State Department spokesman was quoted as saying that whatever the inspectors reported would make no difference to the decisions of the Western powers. Of course, the Western powers are concerned that whatever might be laid before the UN Security Council might be vetoed by Russia and perhaps also by China. 12: What Would Be the Probable Consequences of an Attack? Why is this? It is called "mission creep." When a powerful government takes a step in any direction, the step is almost certain to have long-term consequences. But, it seldom that leaders consider the eventual consequences. What happens? Inevitably, having taken step "A," it narrows its options. It is embarked upon one path and not another one. At that point, step "B" often seems the logical thing to do whereas some other, quite different sort of action on a different path, seems inappropriate in the context that step "A" has created. At the same time, in our highly visual age with the forces of television coming to bear, governments, particularly in societies where public opinion or representation exist, come under pressure to do something as President Obama said in the remarks I have just quoted. Where lobbies represent sectors of the economy and society with vested interests, the pressure to do something become immense. We have often seen this in American history. One political party stands ready to blame the other for failure to act. And fear of that blame is often persuasive. Thus, step "C" takes on a life of its own quite apart from what is suggested by a calm analysis of national interest, law or other considerations. And with increasing speed further steps are apt to become almost inevitable and even automatic. If you apply this model to Vietnam, Iraq and Afghanistan, you can see how modest first steps led to eventual massive involvement. During this time, it is likely that the victims of the attacks or their allies would attempt to strike back. Many observers believe that the Syrian government would be prepared to “absorb” a modest level of attack that stopped after a short period. However, if the attacks were massive and continued, it might be impossible for that government or its close allies, the Iranian and Iraqi governments and the Hizbulllah partisans in Lebanon, to keep quiet. Thus, both American installations, of which there are scores within missile or aircraft range, might be hit. Israel also might be targeted and if it were, it would surely respond. So the consequences of a spreading, destabilizing war throughout the Middle East and perhaps into South Asia (where Pakistan is furious over American drone attacks) would be a clear and present danger. Even if this scenario were not played out, it would be almost certain that affected groups or their allies would seek to carry the war back to America in the form of terrorist attacks. 13: So what could we possibly gain from an attack on Syria? Even if he wanted to, could Assad meet our demands? He could, of course, abdicate, but this would probably not stop the war both because his likely successor would be someone in the inner circle of his regime and because the rebels form no cohesive group. The likely result would be something like what happened after the fall of the Taliban in Afghanistan, a vicious civil war among competing factions. No one, of course, can know what would happen then. My hunch is that Syria, like Afghanistan, would be torn apart not only into large chunks such as the Kurds in the northeast but even neighborhood by neighborhood as in the Iraqi cities. Muslims would take revenge on Alawis and Christians who would be fighting for their lives. More millions would be driven out of their homes. Food would be desperately short, and disease probably rampant. If we are worried about a haven for terrorists or drug traffickers, Syria would be hard to beat. And if we are concerned about a sinkhole for American treasure, Syria would compete well with Iraq and Afghanistan. It would probably be difficult or even impossible to avoid “boots on the ground” there. So we are talking about casualties, wounded people, and perhaps wastage of another several trillion dollars which we don’t have to spend and which, if we had, we need to use in our own country for better heath, education, creation of jobs and rebuilding of our infrastructure. Finally, if the missile attacks do succeed in “degrading” the Syrian government, it may read the signs as indicating that fighting the war is acceptable so long as chemical weapons are not employed. They may regard it as a sort of license to go ahead in this wasting war. Thus, the action will have accomplished little. Thus, as General Zinni points out, America will likely find itself saddled with another long-term, very expensive and perhaps unwinnable war. We need to remind ourselves what Afghanistan did – bankrupting the Soviet Union - and what Iraq cost us -- about 4,500 American dead, over 100,000 wounded, many of whom will never recover, and perhaps $6 trillion. Can we afford to repeat those mistakes?